This product was withdrawn from marketing in the United States on April 7, 2003. The compact printer that grows with your business. 1200 Image Quality resolution delivers sharp, professional documents. The ten adjustable darkness settings let you optimize print quality and performance. 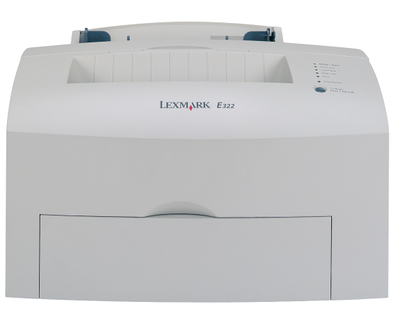 The Lexmark E322 also supports other media such as letterhead, envelopes, cardstock and transparencies. Whether using the Lexmark E322 at home or in the back office, this compact printer will fit just about anywhere. The 250-sheet tray option allows you to increase paper capacity without sacrificing space. This sturdy, compact printer will reliably perform in virtually any standard operating system environment. Parallel and USB support provide reliable connections to your computer or network. Standard PostScript and PCL datastreams allow you the flexibility to print from a range of applications. The easy-to-use and intuitive operator panel indicates toner-low for better supplies management. The single-element print cartridge and the simple drop-in paper loading make cartridge installation and paper feeding a breeze. The Lexmark E322 also offers a 6K high yield print cartridge for reduced cartridge replacements. Speedy 16 pages per minute printing and a less than 12-second time to first print saves you time without sacrificing quality. The 133 MHz processor and 8 MB memory allow you to print high-quality, complex print jobs quickly.